Back in the fall of 2012, food activist Brahm Ahmadi stood in front of a packed room in East Oakland’s warehouse district and made a simple pitch: Would the assorted local business owners and community organizer types who had gathered consider investing in People’s Community Market, the ambitious full-service grocery store that Ahmadi wanted to open in West Oakland? Would they do their part to bring healthy food to one of the city’s most notorious food deserts, where the primary shopping option is the corner liquor store? Fast forward three years, and the People’s Community Market project seemed to be all but dead, despite a successful fundraising campaign that had netted $1.2 million by the end of 2013. The grocery store had been stymied, Ahmadi explained, by a soaring West Oakland real estate market that led landowners to demand upwards of $2 million for dilapidated properties. In short, Ahmadi was ready to build a grocery store, but he didn’t have any place to build it. All that changed this past Monday when, after months of silence, People’s Community Market announced that it had closed escrow on a 15,000-square-foot property at 3103 Myrtle Street in the San Pablo Avenue corridor. And, just like that, West Oakland’s long-awaited grocery store appears to be back on track. 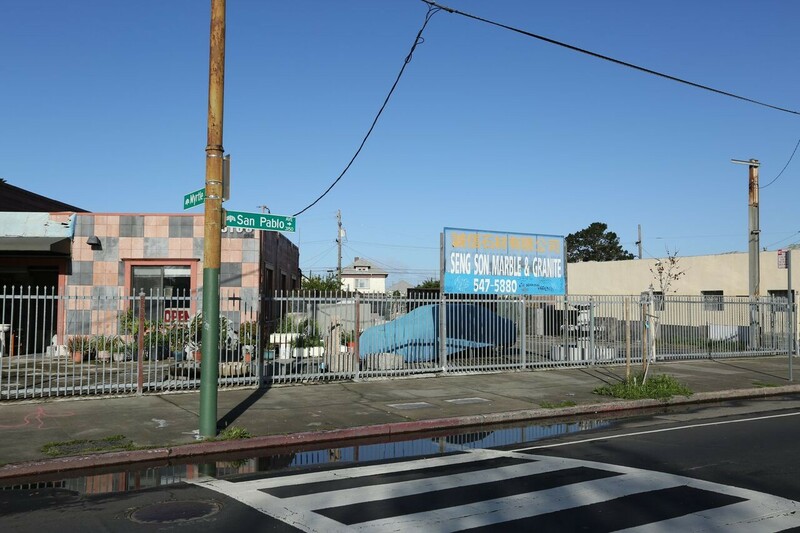 In an interview, Ahmadi explained that, all told, People’s Community Market had bid unsuccessfully on seven different properties in West Oakland, all along West Grand Avenue, over the course of the past two years. In no instance was the market actually outbid on a property. Instead, the project was kept in limbo because of what Ahmadi described as “outrageous speculative behavior” on the part of the landowners, most of whom had bought their properties cheaply in the Eighties and were now just sitting on them in hopes of a big payday — basically, in hopes that someone would pay them two or three times their market value. People’s Community Market ultimately paid $970,000 for their current proposed site — an expensive, but comparatively reasonable, $60 per square foot. Other property owners had demanded $90, or even $180, a square foot, Ahmadi said. It was only through a couple of key partnerships that People’s Community Market was finally able to seal the deal on its Myrtle Street site. Perhaps most importantly, an angel investor stepped in and agreed to put up cash to pay for the property. That investor has chosen to keep his identity secret, but Ahmadi described him as a former hedge fund guy who made his fortune on Wall Street and had returned to Oakland, his hometown, hoping to, in Ahmadi’s words, “reform himself” by doing something good for the community. The second important piece was that Ahmadi brought on the East Bay Asian Local Development Corporation (EBALDC), an Oakland-based affordable housing developer, to handle the nuances of a somewhat complicated real estate transaction. Essentially, the angel investor loaned the $970,000 to EBALDC, virtually interest-free, and EBALDC will act as the grocery store’s landlord. What People’s Community Market will get out of it is a pretty good deal: three years rent-free while the business establishes itself, after which the store will negotiate a market-rate lease with EBALDC. Joshua Simon, director of EBALDC, explained that the organization’s involvement in the grocery store is part of its Healthy Neighborhoods initiative that takes a more holistic approach to defining what makes a neighborhood healthy, beyond just affordable housing. Of course, part of that includes job opportunities and access to healthy food — hence the partnership with People’s Community Market. A number of pressing questions about the store’s long-term viability remain, not the least of which is: Will enough people shop at a grocery store located in an area that everyone connected to the project acknowledges has had significant issues with violence and public safety? And then the other edge of that sword: If the store proves to be popular, who’s to say it won’t become a source of the very gentrifying forces that Ahmadi says he hopes to contain? Ahmadi, for his part, is sanguine about the inherent tension: “The reality is that anything you do to improve the neighborhood will make it more attractive to other people as well.” That said, he cited various efforts on the part of People’s Community Market to collaborate with current West Oakland residents. One fortuitous partnership has already emerged: The grocery store will lease the parking lot of St. Matthew’s Missionary Baptist Church, a historic Black church located next door. 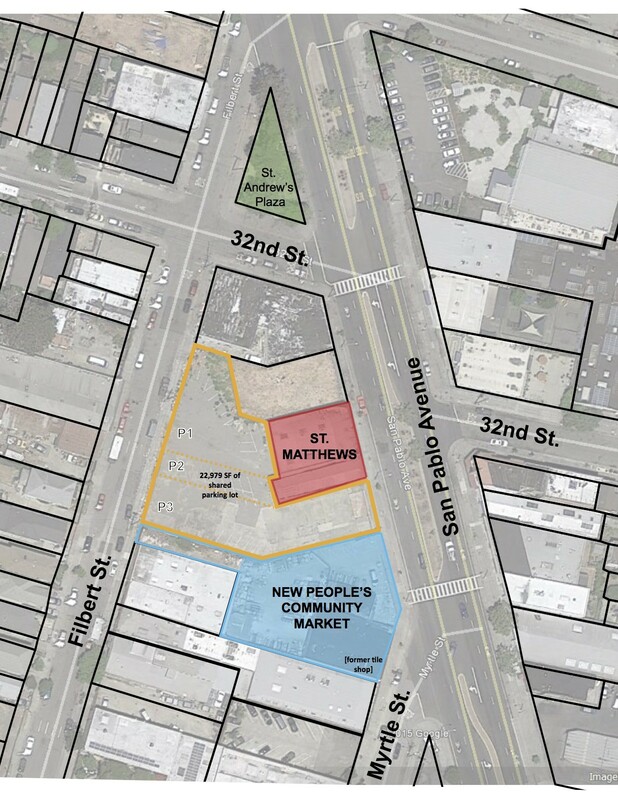 The deal will provide revenue for the church, but according to Altheria Jinks, the church’s president and CFO, the St. Matthew’s congregation believes in the project’s mission and wants to work with the grocery store to do something positive for that stretch of West Oakland. “We need places where we can go shopping instead of taking our tax money and going to Emeryville,” Jinks said. Beyond that, Ahmadi said that People’s Community Market will have fifty employees when it opens, mostly hired from the surrounding community. Eventually, the plan is to move toward an employee ownership model — so those fifty employees will stand to benefit even more directly from the store’s success. In addition, Ahmadi pointed to the market’s somewhat unorthodox fundraising method of using a Direct Public Offering (DPO), in which members of the community can become shareholders for a minimum $1,000 investment. The market will soon do another DPO round, and Ahmadi said he’s in talks with a foundation that wants to subsidize the bulk of that $1,000 minimum for West Oakland residents who are willing to put up, say, $100. (The exact amount of the subsidy has not yet been set.) Again, the idea would be to increase the number of people in the neighborhood who have a direct personal stake in the success of the store. As for next steps, Ahmadi said he has to obtain permits from the city and raise another $7.5 million, mostly through loans. If all goes perfectly, People’s Community Market will be ready to open by late next summer. Clarification: This story has been edited to clarify that the exact amount of the potential DPO subsidy has yet to be determined.